It was seven years ago that I was on the Tulip Ride organized by Gary Strauss that I met my current ride buddy and friend, Annie. I had led a group on a wild-goose-chase, trying to find a backroad that existed only on my map and retreating only to be caught in a rainstorm as we hauled ourselves back to our cars. Since this weekend was the last of the Tulip Festival held in Mt Vernon, we thought it fitting that we go up there for a little ride. 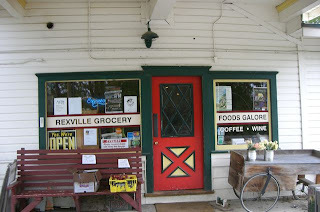 We parked at the Transit Center in MV and, in a light mist, headed out to see some flowers. 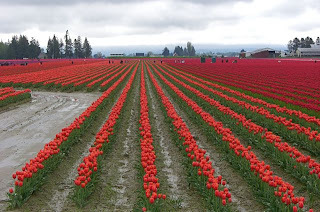 I had the current "bloom map" along and it was mostly accurate, leading us to two out of three fields of brilliantly colored tulips. 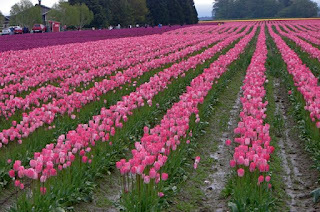 Pink, variegated pink, purple, red, orange, they were all neatly arranged in rows and sections. Being that we were on our bikes and we had our little Italian bike shoes on, we didn't dare venture off the paved road and into the mud, for fear we would never click back into our pedals. We admired the flowers from afar for as long as we could stand the brilliant colors firing our rods and cones, then headed south and east for some varied terrain. We climbed up and over the shoulder of Devil's Mountain on Hwy 534 toward Lake McMurray. The devil it sure was, as we were rained upon after reaching the east side of the mountain. Cheerfully, we thought that would help to clean off our bikes after they had picked up mud on the flats of the farmland. Then, we passed a series of lakes and crossed the Nookachamps Creek several times as it rambled through the verdant valley. We had an encounter with a friendly dog (see post here from last year regarding this same dog) and also with an aggressive one, though he was about as big as a rat and I was more worried about running him over than being bitten by him. Just when Annie noted that we were already at mile 45 of our supposedly 45-mile ride, we saw a sign welcoming us to Mt Vernon. At that point, sidewalks appeared, ranches gave way to homes and we started to look forward to our post-ride meal at the Skagit Valley Co-op. When we made it back to the car, we had rolled out a lovely 50 miles, with lots of scenery, quiet roads and a few challenges, much like the ones we encountered when we first met.